Autumn is just around the corner, and the AMC 2013 Fall Hands On Newsletter is filled with ideas to help make Autumn 2013 truly meaningful for the children in your life. Most of the ideas, lesson plans and other creative offerings have been generously donated by the participants of the AMC Resource Center http://www.amonco.org/directory.html, and I have contributed a few myself. This newsletter is free of charge and contains free lesson plans, recipes and crafts. Learning algebra is critical for student success in school and work in any technical field. But there is another reason for students to begin learning real algebra at an early age. When an 8-year old can understand and solve algebraic equations that are not normally presented until the 7th or 8th grade, the student feels EMPOWERED. HandsOn.doc Consider an equation such as 4x + 5 = 2x + 13. Here is Eric, age 8, solving the problem in this video solution. (He is showing the solution on the Teacher’s Demonstration Scale, which is not part of the Hands-On Equations Deluxe Home Set. However, it is easier to see the solution that way.) As you watch the video you will get the sense that Eric understands every step of the solution process. There is nothing about this equation or its solution that Eric finds mysterious. That is the key! Our goal is to enable students to see that math makes sense. It is logical. It is not a set of rules to memorize without knowing where those rules come from or what they mean. And, amazing as it sounds, Eric learned to solve this equation in just three lessons! This is testimony to the remarkable teaching methods developed by Dr. Henry Borenson, who received a patent for Hands-On Equations. You are encouraged to participate in a FREE Hands-On Equations Introductory Webinar. The next one is scheduled for Thursday, July 31, 2014 from 9:15 a.m. to 10:00 a.m. EDT. The Hands-On Equations Deluxe Home Set is ideal for home use. It includes the Hands-On Equations Instructional Video Manual (from which the above video clip was taken). Every one of the 25 lessons of Hands-On Equations will be demonstrated for you or your child by either Eric, Molly (age 11) or Dr. Borenson. Also included in the Deluxe Home Set is the Introductory Verbal Problems Workbook, which contains some 80 verbal problems. For example, problem #61 asks, “The length and width of a rectangle are 2x and x + 1, respectively. If the perimeter of the rectangle is 38, how long is each side?” Using two pawns to represent the length and a pawn and 1-cube to represent the width, we can consider the semi-perimeter of 19 to get the equation 2x + x + 1 = 19, where x is the name of the pawn. You may download the Fun Way to Learn Algebra app for free for your IOS, Android or Kindle Device at the App Store, Google Play or Amazon Appstore. Hands-On Equations 1, 2 and 3 are also available. 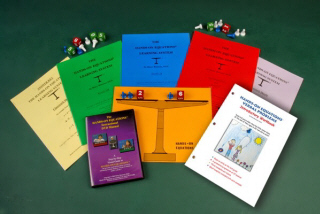 For more information about Borenson math products and workshops, please visit the website at www.borenson.com or take a look at this brochure. 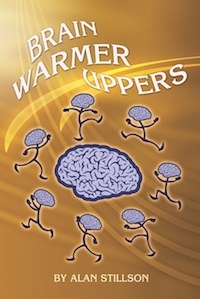 The source book for the puzzle columns is BRAIN WARMER UPPERS, a perfect e-book for students, parents and teachers. 5. DID QUEEN LATIFAH OUTWEIGH TINA TURNER? Written by Alan Stillson . There is no exchange of money. Stillsonworks does not require a written agreement for the use of puzzle columns. However, if you require a written agreement for its use, we are amenable. You get a free puzzle column for your publications and we get exposure for BRAIN WARMER UPPERS. If you’d like to try the free puzzle column, please send an e-mail request for it and I’ll send you an initial batch of five columns. If your readers like the puzzle columns, please e-mail a request for free additional batches. Are you an expectant mom? How are you coping? Take a moment now to read Support Systems from A Life of Love and Joy. for some heartfelt advice. If you know of a loved one or friend who is a soon-to-be-mom, feel free to forward the link to her, as well. Check out the following websites to design your own kite unit study!